Are you organizing a party or an event in Cork? Do you need professional photos that will bring back memories in years to come? Are you looking for a photographer that is relatively cheap compares to other photographers in Cork? Well if so you have come to the right place. I am a professional photographer and DJ in Cork with over 4 years experience in photography. After DJing at so many parties and events over the years I realised that i would eventually be to old to be a DJ so I decided to pursue a career in photography. Ever since I completed a photography course at University College Cork I have been taking photos for people at different events in Cork City and County. WHY BOOK A DJ AND PHOTOGRAPHER? The reason why so many people book a photographer as well as booking a DJ is because of the price. We only charge an extra €50 to take professional photos on the day of your event. 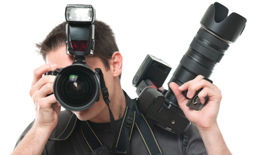 If you were to book a photographer separately it might cost you over €300. You might be thinking why we can do this at such a low cost. Well the reason is, when we upload the photos of your event on our Facebook page with our logo on each of the pictures it will help us to promote or DJ company and get more gigs in the future. 2 hours taking pictures during your event (around 100/200 pictures). Editing all your pictures by computer. Ability to add a logo of your event to each of the photos. Pictures will be delivered within 24hrs after your event by a download link in HD.